Whizz kids: (l-r) Liam Baker, Sean Wentzel, Dylan Nelson and Robert Spencer ensured that UCT was ranked 18th among 72 participating universities taking part in the annual international mathematics competition for university students. The UCT flag flew high in Bulgaria at a recent international maths competition, where the university achieved a ranking higher than some of its top international counterparts. The university’s ranking at 18th saw it ahead of Yale (25th) and Cambridge (32nd). 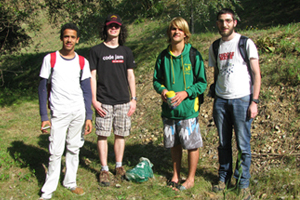 The team representing UCT in Blagoevgrad, a city in south western Bulgaria, consisted of Liam Baker, a maths honours student, first-years Robert Spencer and Dylan Nelson, and Sean Wentzel a second-year student. The four team members are no strangers to international competitions – as school boys they represented South Africa at the International Mathematics Olympiads on more than one occasion. Dr Henri Laurie of the Department of Mathematics and Applied Mathematics led the team. Laurie, like team leaders from other universities, also marked the papers in the competition. Wentzel and Baker were awarded first prizes and given gold medals after being ranked overall 30th and 33rd respectively. Spencer got an honourable mention in the competition, which took place over two days, and in which 321 students from 72 universities participated. According to Baker competitions like these not only stir interest in mathematics, but it also maintains an interest in the subject. “It is also an opportunity for us to measure ourselves against students from other universities,” he added.